I do not usually do restaurant reviews. I am not a food critic unless I break a tooth or fall ill as a result of dining, but today I felt to rave about a small eatery in Glasgow's Victoria Road. Lagom Kitchen is run by the elder daughter of close friends, so I am declaring a bias at the outset - although if I had found fault with this wonderful little establishment I would have continued my 'not a food critic' career. 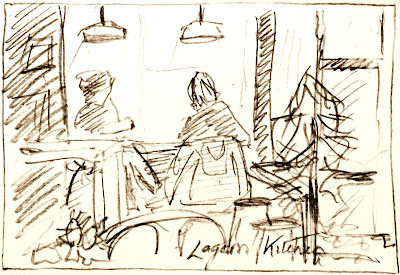 Lagom - at least in this context - refers to the Swedish idea of simple and perfectly balanced, if I understand it correctly, and this is the simple and balanced description of Lagom Kitchen. The choices on a small but inspired menu cater for most palates and our lunch - capped with a second coffee and a dollop of exquisite cake - met our needs for the rest of the day. Milady and I decided that when next in the city on business, we would take a detour to Lagom Kitchen. It quite made our day. Now from the sublime to the ridiculous. In a sense, I find myself wondering why I bother writing this sort of stuff. The situation on both sides of the Atlantic will have changed before I have finished this sentence, let alone completed my comments. Treat it as me getting some clutter out of my head and on to the screen before me, so that I can put it all behind me. The American mid term elections are now over and Donald Trump has rounded off the occasion by sacking his attorney-general Jeff Sessions, for reasons I find difficult to get a sure grip on (except that this is the sort of reaction we have come to expect from The Donald). I suspect that it has something to do with preparing for a Democrat onslaught now that they control the House of Representatives. I read in one of the Sunday Supplements recently that many now consider The Trump Thing to have Narcissistic Personality Disorder - a notoriously difficult problem to diagnose but easy to recognise. We can all have narcissistic moments; what makes it a personality disorder is when it is so deeply ingrained it becomes 'a long-term pattern of abnormal behaviour'*. It appears that DT (Donald Trump, not delirium tremens) fills the profile of a classic case. If this is indeed an accurate diagnosis then we are dealing with "a bright six year old" in charge of the world's most powerful democracy. No comfort there then. Listening to BBC Radio 4's PM programme yesterday afternoon while returning from Lagom Kitchen, I was struck by the vituperative bile being poured out - not only from DT, but also from journalists, politicians and commentators riled anew by behaviour we should be expecting by now. Why is that? Is it because of the deep dislocation with what most of us consider to be within the bounds of 'normal'? DT jacks up his rhetoric to a level that incites normally calm and considered individuals (like myself) to apoplectic disbelief at the sheer wrong-headedness of what is being said. I fear that DT believes that what comes out of his mouth makes some kind of sense. And yet a sizeable proportion of the American electorate apparently think he is doing a good job. They must have an understanding of the mendacious drivel that alarms the rest of us. Presumably they also see that, inevitably, DT will find that the American people will fail to live up to his expectations and so, they too, will be sacked. In Britain however, the Brexit negotiations are 95% done ... hoorah! Only the Irish border problem remains to be decided. Irish comedian Neil Delamere pointed out that the border between Eire and the North, at various points, not only goes through the middle of houses but down the centre of roads. He suggested that a passport might be necessary if overtaking, and that you would end up with a pile up of notifications on your moblile 'phone as you roamed back and forth between service providers. This may be an exaggeration for comic effect but it does rather neatly express the difficulty involved in this situation. Like so many things in Ireland, there is no solution without near-complete capitulation on one side or the other. I mean no disrespect to the Irish - I am part Irish myself - but it seems to be one of those follow me I'll be right behind you moments. Well done GB, you got what you voted for, if only you'd thought it through first. The lessons from history reveal that the division and discord we are experiencing across the globe require a catharsis to bring about a semblance of harmony. Too often, that catharsis has been armed conflict. I pray that sufficient numbers both in the United States and in the United Kingdom (as well as in Europe) come to their senses and turn from folly before it is too late.